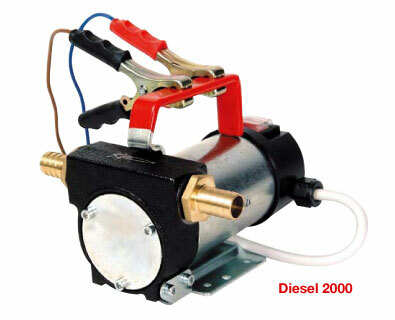 The Diesel 2000 is a low voltage, D.C., rotary-vane, self-priming pump with a bypass valve and cast iron pump body and is for diesel transfer only.It is also fitted with fuel meter to assist the transfer It has a steel shaft, which is fitted with a lip seal. The TEFV, IP55 motor, which has a duty cycle of 30 minutes, is fitted with crocodile clips, a line fuse and an on/off switch. A useful carrying handle is fitted. Maximum suction lift, with a foot valve, is 5 metres, however without one, 3 metres, or less, is recommended. Maximum permissible liquid temperature is 50�C. It should not be allowed to run dry, so it should always have an initial priming of diesel. It MUST NOT pump water, petrol, high viscosity liquids, chemicals, solvents or products with a low flash point.